Mandy Joy ♥: hadley / january. I will be documenting Hadley this year by giving monthly updates on what she is up to! 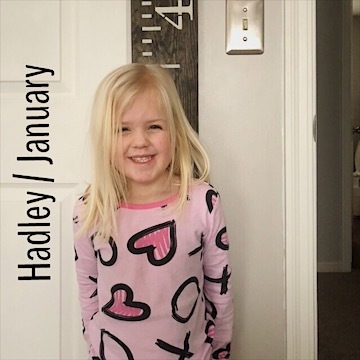 This is what Hadley has been up to in January 2019. DRINKING: Kool-Aid (red & blue). PLAYING: Babies and grocery store. WATCHING: Indian in the Cupboard. ENJOYING: Playing in her room. If interested in seeing 2018 of Hadley each month, click here.